It is billed as less invasive than standard surgery. The manufacturer, Intuitive Surgical, states that “you can have major surgery with only a few tiny incisions. 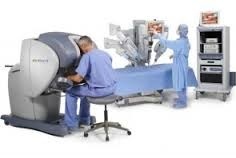 In addition, your surgeon can operate with better visualization, precision, dexterity and control than possible using traditional surgical approaches.” It’s like drawing a picture on a computer—you can zoom in to a level that is impossible with simply the human eye, and you can operate tiny surgical instruments that are impossible to hold with human hands. It’s not a stretch to imagine that one day we will be able to perform surgery on a cellular level. The medical device community knows this well—Intuitive Surgical made $233 million in profits last year. Any surgery that goes wrong because of doctor negligence can be the basis for a medical malpractice lawsuit. Any surgery that goes wrong because of the negligence of a medical device can be the basis for a product liability lawsuit. Usually it is pretty clear where the fault is. When a da Vinci surgery goes wrong, the question is very complex. Recently, one such federal lawsuit was filed against Intuitive, alleging that the da Vinci killed its patient—a 24-year old woman who was in for a hysterectomy. The lawsuit alleges that electrical current jumped to the patient, causing severe burns to an artery and her intestines. She died two weeks later. A number of complications have resulted where doctors at Wentworth-Douglass Hospital used a da Vinci, including cut bladders, cut ureters, and possibly a lacerated esophagus. Fortunately, the evidence is likely to be there—the computer will have a record of all commands sent to it, and all actions taken. Essentially, it’s like finding a black box after a trucking accident or an airplane crash. There should be a record of all data sent to and from the machine, which should allow experts to identify where the problem originated from. In many cases, that data might clear the surgeon from liability, showing that he did everything right and that the defect came from the machine. Computer programmers/software engineers: to prove that the programming was defective. Medical experts: to prove what the surgeon expected the da Vinci to do, and what the surgical standard of care was. Mechanical engineers: if the problem involved the hardware, an engineer will need to testify about how the design of the product was defective. Chain of custody/maintenance: someone, probably from the hospital, will have to show that the machine was in substantially the same condition as when it was sold to them. They will likely have to prove that the machine received all relevant software updates, and that it was not altered in any unapproved way. Training: If the surgeon did something wrong, it may be because of inadequate training by the manufacturer of the da Vinci (many doctors caution that the computer requires extensive training). A training expert will have to review training logs and determine whether the surgeon was properly educated. The difficulty here is whether manufacturer recommends inadequate training, or whether the hospital offers limited training. This is the distinction between a product liability lawsuit and a medical malpractice lawsuit. 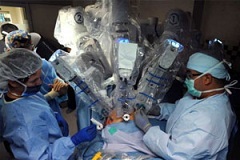 One more note about the training—some doctors experienced with the da Vinci caution that it can take between 200 and 750 surgeries to master the device. That’s a steep learning curve, especially for those first 750 patients. If your doctor tells you he plans to use the da Vinci, find out how many other surgeries he or she has done with it. If you have experienced an injury after a robotic surgery or procedure, including one by Intuitive Surgical’s da Vinci Surgical System, contact our medical malpractice and medical device lawyers at 1.800.553.8082, or online.